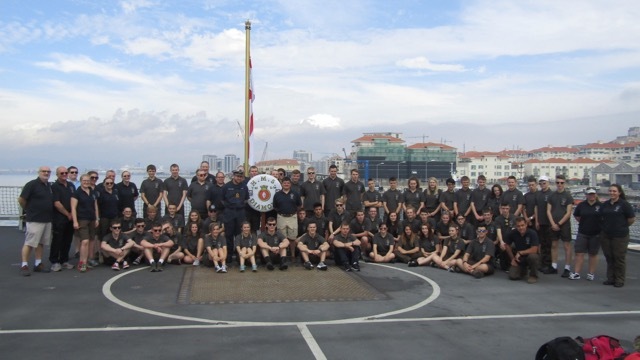 Excited – the majority feelings among cadets prior to travelling, mixed with a healthy quantity of being curious, motivated, adventurous, anticipating something new, keen to get started, yet there was the inevitable sense of being apprehensive and nervous……. why? The exercise was to be a travelling adventure, of course, with a strong element of culture and history, military significance, contemporary political implications and cadet training whilst participating in a primary programme of challenging adventurous pursuits. Some are not always available at regular cadet camps, especially those which involve water – sailing, paddle boarding, power boats, swimming, and caving. In the end, it also turned out to be an exercise in local history with the awesome addition of a serious, and quite unbelievable geological adventure going back millions of years, and unearthed almost by coincidence during the digging of the now famous Gibraltar Rock tunnel systems. There was opportunity to explore the Rock itself, in a challenging series of planned walks including the famous Mediterranean Steps, which is a thousand feet of steep gradient steps from foot to top, and the relatively new Suspension Bridge, which has opened up new aspects of the Rock’s surface. This was a unique experience for several in our party, having not flown previously, and as we alighted our coaches for the relatively short trip down the A42 to Birmingham International Airport at 09.00 on Friday 21 October, there was a growing sense of anticipation – but mixed with a healthy respect for the unknown! Let the Gibraltar adventure begin! The careful plans, and time management for an expedition of this nature, involving so many young people, and adult instructors, have been enormous, and yet there have been so many unavoidable alterations enforced upon us from the hosts’ end. Even so, as with any expedition, for any organisation, once one gets to the destination, there are more issues to be confronted – human, practical and organisational; we are no exception. The logistics on this unique peninsular are such that we are involved in a lot of walking just to get to activities – not to mention during, frankly; and all of this is time and energy consuming with a humid weather system, and temperatures usually in the mid 20s °C. As part of our preparations, we suggested cadets share their thoughts and impressions as we progressed, and maybe a few photographs. We began the first day with a familiarisation session, with an orienteering type meander through the unfamiliar streets of Gibraltar town, with map and grid references, and Gun Wharf as the destination. It ended with our arrival at the island’s open-air swimming pool – closed down for the winter, but made available to us – where all members participated in a basic swimming and personal survival test before undertaking any of the sea adventures. A chance meeting led to the whole party being invited to share a guided tour around HMS Diamond. It had unexpectedly docked in the Gibraltar Shipyard, also known as Gun Wharf, on route to Portsmouth after a 3 month stint on the Libyan coast. It produced a unique and life long memory for our party, with a friendly ship’s company that made us all so comfortable on board and welcome guests. So, onwards and upwards; literally in fact, as we made our way to the top of the Gibraltar Rock, by one route or another, for the first day’s programme – some walked using the infamous ‘Mediterranean Steps’, but some used the internationally famous Gibraltar cable car, equally exciting but less physical. Whichever route was taken, there was much excitement at seeing, or being jumped on by, or despite warnings some would possibly say ‘mugged by’ in a couple of cases, the Apes on the Rock. They are Barbary Macaques, with significant importance to the area, and definitely a prosperous tourist attraction, awaiting unprepared visitors at the arrival point of the cable car who unwittingly offer prized food. Among frequent users are day-trippers from the numerous cruise ships that dock in Gibraltar marina for up to 24 hours at a time and provide essential tourism income for the area. However, back to the purpose of our particular excursion to the top of the Rock, and undoubtedly a physically arduous exercise – carried out in temperatures up to 23°C, and lots of water consumed. It was a highlight, with notable landmarks of the Rock’s unique history of war and defence along the way, but from the Rock – on a good day – one can spot mainland Spain and even Africa, with the Atlas Mountains in view. As we returned, a glance at the Health app on an iPhone reminded us that we had actually completed a 15.5km round trip. For those of a more robust nature, however, there was still time for an evening at the sports centre, and the 10 pin bowling facility; others shared a game of rounders on the astro-turf football pitch in front of our accommodation block, or an evening on the fixed climbing wall with qualified instructors. 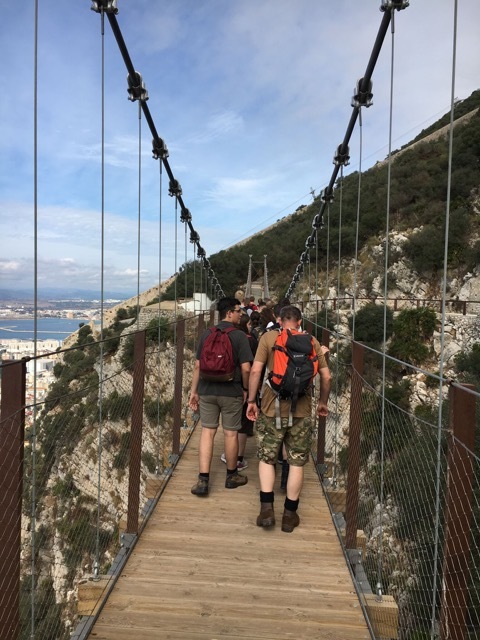 An exciting, packed, original, probably unique, training expedition to Gibraltar for this cohort of 75 cadets and adults from Derbyshire ACF, was geared to a well behaved, mature, visible and excited presence in this small peninsula with such historical and strategic importance. This is a hugely diverse exercise, with much to do, lots to see and learn about, and a good balance between hard work – it definitely is not a ‘jolliday’ – with cadets benefiting from a half term to be remembered. 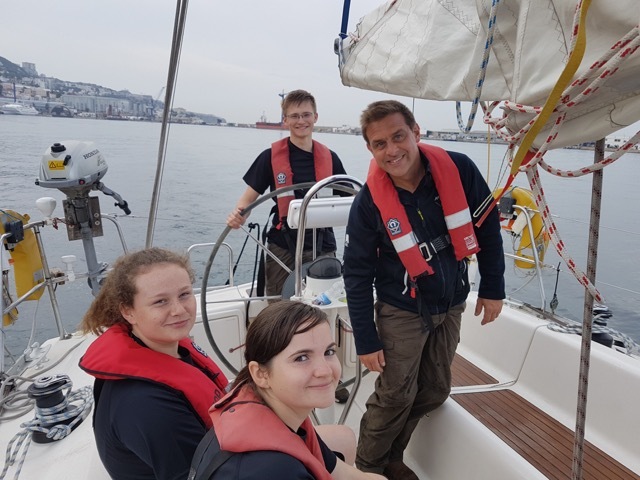 The sailing programme at Gun Wharf progressed throughout the week, with Marcus Caston as our talented and patient instructor from the Royal Yacht Association. His skill allowed every member of the party to learn the basics of off-shore sailing, for the first time, and offer the opportunity to put them into practice. Sailing here is notoriously tricky due to prevailing winds, gusty showers, and the extraordinary direction of wind diverted around the Rock. It was both exciting and a timely reminder of how dangerous sailing can be. 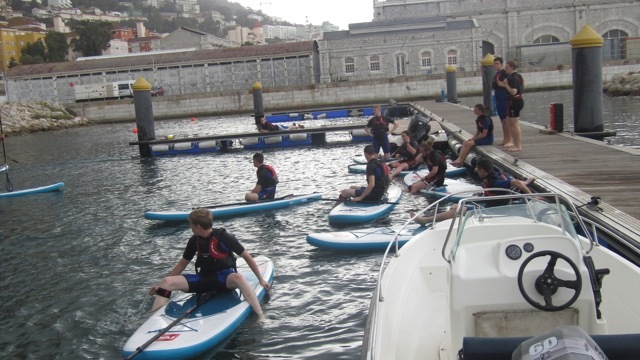 Gibraltar’s Gun Wharf became the second home to the Gibraltar party, because all of the water sport activities have been there – with the kind assistance of permanent staff and our instructors – so, for two more days sailing continued, with the addition of Paddle Boarding – a relatively new introduction, and demanding, but great fun when it is mastered, and trips into the Sound on power boats, which is not for the faint hearted, but exhilarating. 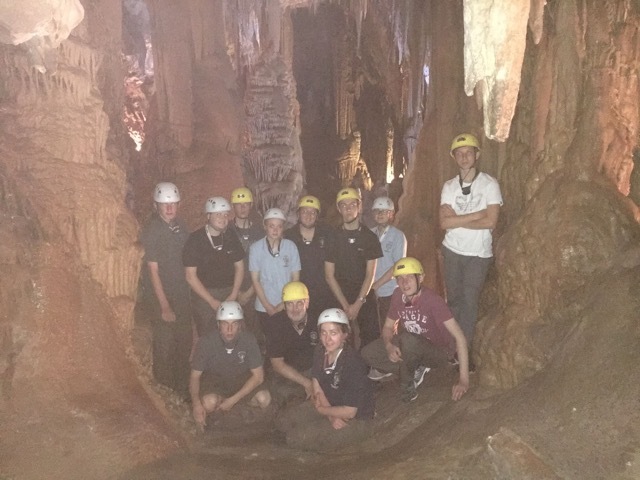 Amidst all of this, designated groups went off to explore the St Michael’s Cave system with local guide Peter Jackson, who impressed us with his encyclopaedic knowledge of Speleology, or the study of caves and caverns. In the caves, he guided and encouraged, whilst displaying a skill for swinging on ropes and leaping effortlessly from point to point, across unknown hazards, and unfathomable chasms. There were twists and turns, climbs and drops using ropes and careful placing of feet, narrow gaps, water features…but most impressively there were truly amazing natural geological features. An exhausting couple of hours, of course, but nobody failed to get back to the start, and everyone was awe struck by the unique experience. From the sublime to the ridiculous, they say – but the caves were followed by an evening of iceskating, followed by a sneaky burger and free wifi on the way back… always time for that. For those on the alternative rota, it was an evening using the camp’s own fixed Climbing Wall, along with football and rounders again! All tiring, and guaranteeing a good night’s sleep, after a briefing as to what was to follow the next day. Saturday – our penultimate day on the peninsular – was a catch-up time for those who had not yet been involved in activities, whilst others took advantage of another trip to the Rock – always offering new vistas in the harbour, with its ever passing fleets of naval, cargo and passenger ships. It is wondrous to take in at a glance, the site of European Spain and African Tunisia, with the Atlas Mountains in the distance, yet just 35km or so away; they extend some 2,500km across northwestern Africa, spanning Morocco, Algeria and Tunisia, and separating the Atlantic and Mediterranean coastline from the Sahara Desert. At the end of yet another busy day, well at least a morning in this case, we arranged a sport activity circuit competition in groups, augmented on this occasion by visitors from the local youth group. It was a heated occasion – naturally, if you know anything about youth sports days – and prizes for those with highest points aggregate. It was followed by a barbeque prepared by our own chefs – shared also by a distinguished group of local visitors and distinguished dignitaries. Sunday, 30th October 2016 was used for a short act of worship at the historical King’s Chapel, adjoining the Governor’s official residence in the centre of town, allowing a time for reflection after a hectic expedition. We considered what we had experienced these last few days, how that meets the experiences of Gibraltar and its challenging history, and how that might be applied to future situations we find ourselves in. The young people have benefited from the experience of learning new skills in challenging environments, not normally experienced at home, adapting to new situations and overcoming the fear of the unknown. With this final day bringing our stay to a close, and a late flight back to Birmingham, temporary recreation was sought on the beach and in the sea, by some, before packing and making our fond farewells to Devil’s Tower Camp, which has accommodated us so well. None of this would have been possible without the kind and generous support of those who have contributed to its costs – individuals have raised funds, but organisations like the Ulysses Trust have facilitated the expedition and its aims. We have tried to outline what we have identified as benefits to the individuals who travelled, and the organisation that they represent. However, there are inevitably benefits that we will only become aware of with the passing of time – and as the young people develop into responsible and talented adults.